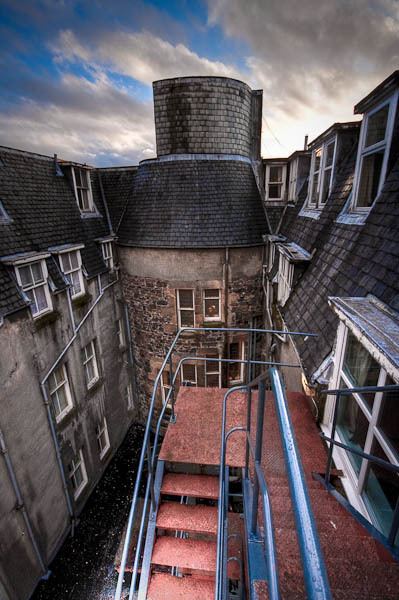 While at the conference in Oban last week I tried a quick handheld HDR image of the fire escape and inner view of the hotel we stayed in. The range of dark low down and brightness high up in the image made it difficult to get a good exposure without HDR. The beauty of the 40D is that its 6 frame per second allows you to set auto exposure bracketing and then hold the shutter long enough for 3 exposures. That takes 1/2 a second, so with a steady hand you get virtually no movement between the exposures. I blended and tonemapped them in “photomatix”. I think there’s something creepy about this?